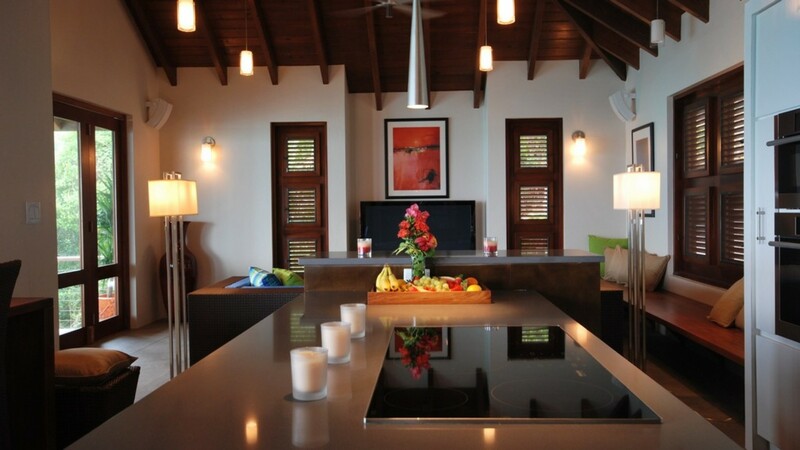 Welcome to Villa Aja, a stunning 5 bedroom villa rental on the beautiful island of Tortola in the British Virgin Islands. 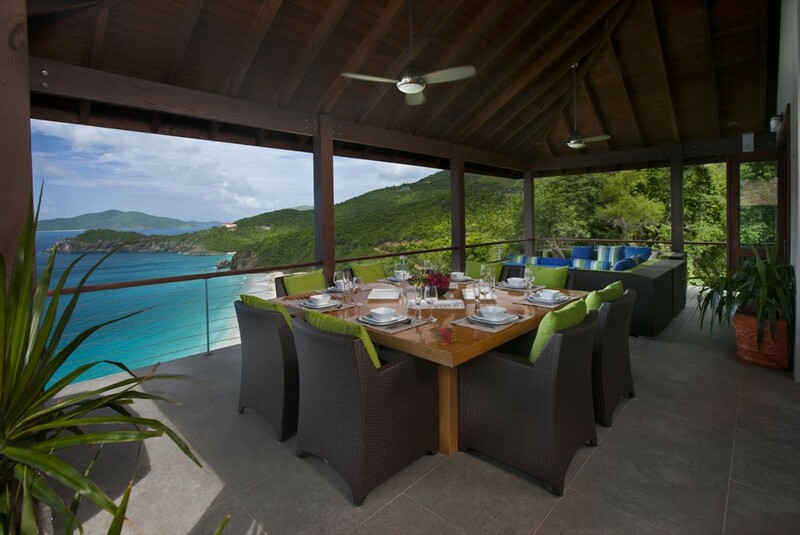 Aja is a secluded luxury villa vacation rental, on the North shore of Tortola, which provides some of the best views of the ocean. 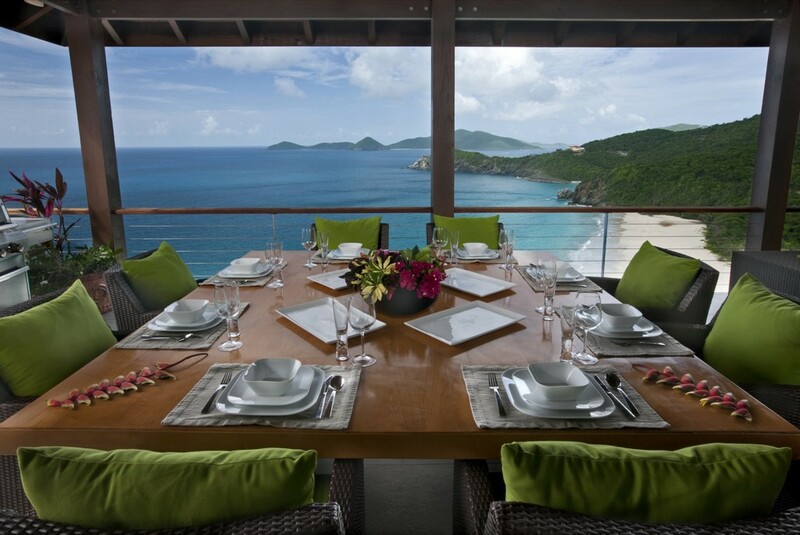 The villa is located in an elevated position overlooking Trunk Bay beach. 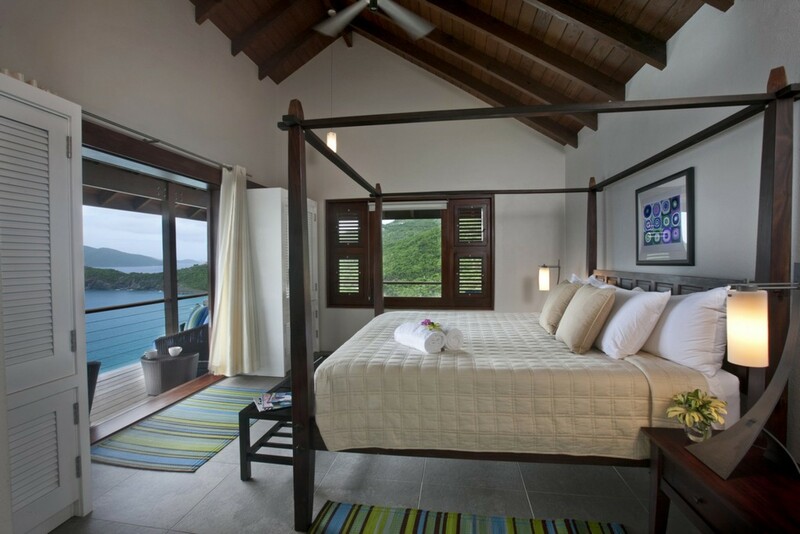 Aja is one of the nicest villas on Tortola and is the perfect beach holiday for your family. Villa Aja provides its guests with a unique and memorable experience, where they can feel pampered in luxurious surroundings, take full advantage of the spectacular location and feel close and integrated with nature, with the mesmerising sound of waves lapping the shore below. Imagine waking up in the ocean front luxury villa hearing the sounds of the surf. Mornings can be spent sun-bathing or swimming on the beach which can be accessed by a very short drive from the villa. This glorious stretch of unspoilt soft sandy beach remains nature’s untouched little secret. Enjoy lunch under the shaded terrace overlooking the Azure Ocean. 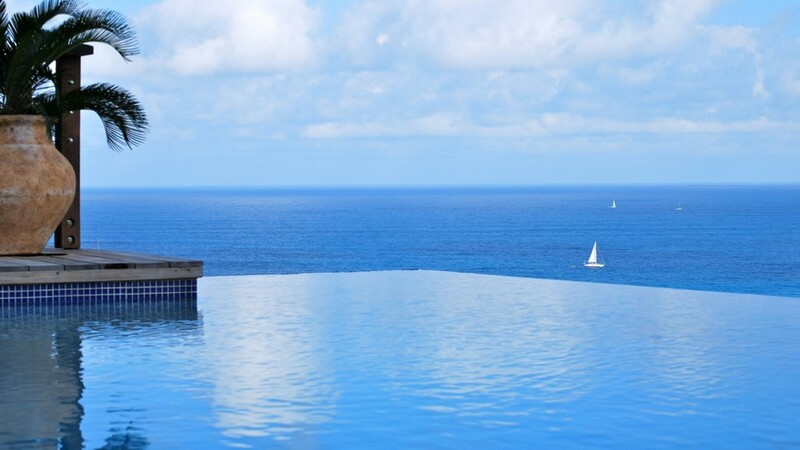 Afternoons can be spent on the gorgeous infinity edge pool with family and friends. This modern villa is minimalist in style with clean lines and vibrant art deco colours of lime, blue and orange, encompassing Asian and art deco fusion and combining modern furniture and design with bold and bright colours in an exquisite Indonesian tree-house layout. 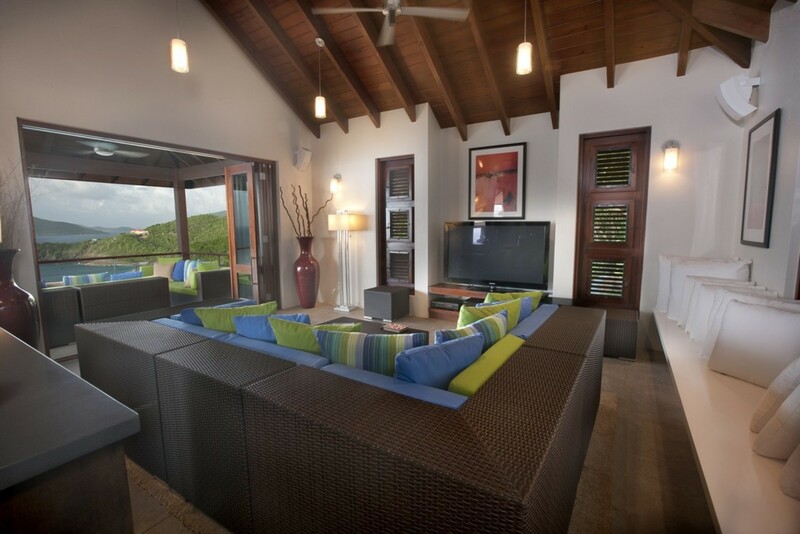 Aja is centrally and conveniently located within the Parkers Estate development on the North Shore of Tortola. 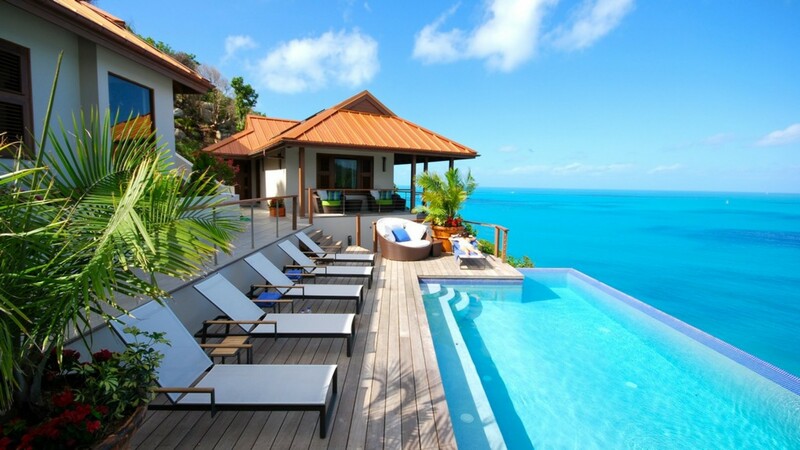 Once you enter the development, you drive a few hundred yards along a concrete road to be met by an incredible and completely unique vista which encompasses Trunk Bay beach and the chain of islands looking North East from Guana, Great Camanoe, Virgin Gorda, all the way backed down to Necker Island. After the concrete road, you travel a few hundred yards on an unmade road (well graded and not very steep but be careful in the rain) which takes you to the driveway and the front gate of Aja. A large, Javanese door amongst extensive tropical landscaping marks the entrance. 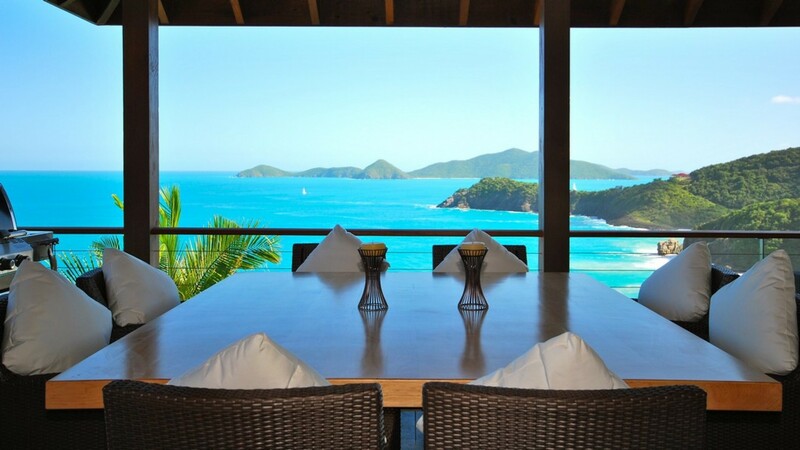 Once through the doors, you enter the heavens, a breathtaking spectacle as you look across the dramatic Trunk Bay, with the chain of islands from Guana through to Neckar and a tremendous wash of turquoise blue from the infinity pool to the ocean below. 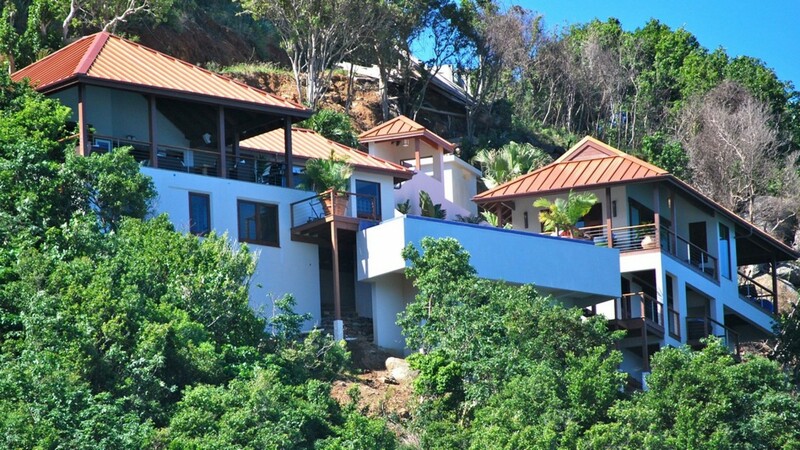 Follow the stone staircase down to a walkway, to the right of the walkway and pool deck sits the living room/dining room and kitchen area, entered through a large outdoor entertaining veranda offering welcome shade from the midday sun, luxurious day beds with blue and lime-green cushions and spectacular sea views. 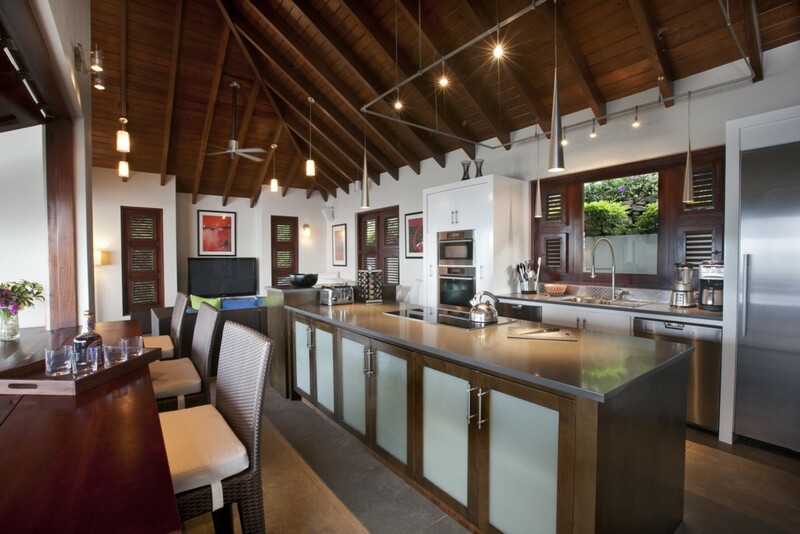 Villa Aja comes with a fully equipped kitchen perfect for a gourmet Chef. A chef can be available on request. The kitchen offers a contemporary European design with state of the art equipment and features. The lounge is built for entertainment with a 58inch flat screen TV, indoor and outdoor music system hooked, a DVD player and sky dish. 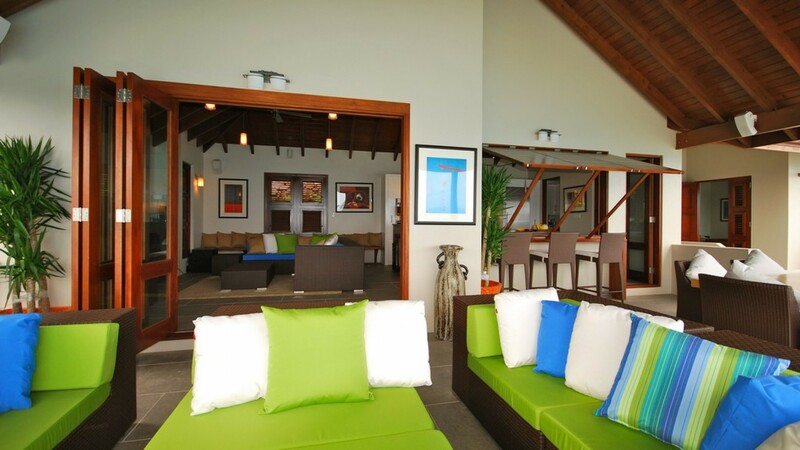 The lounge offers ample seating with a large L-shaped sofa and a long white bench to the side covered with vibrant cushions of lime-green, blue and orange. The whole side wall slides open, inviting the cool breeze in and a spectacular backdrop to while away the hours. 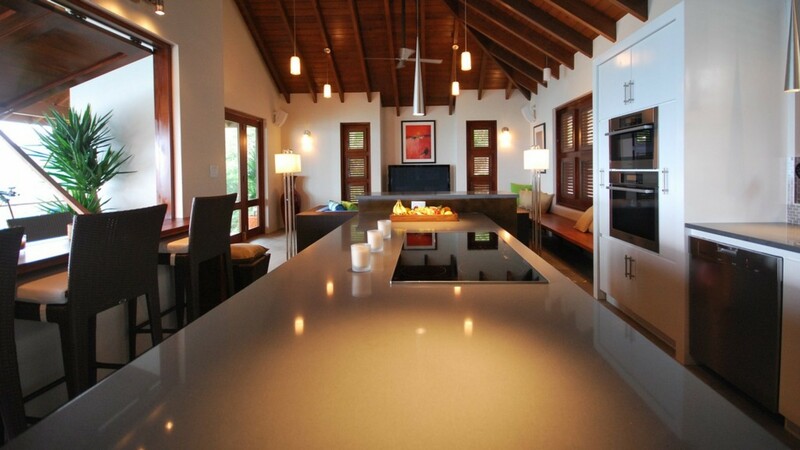 Comprising two separate structures connected by a central walkway, Villa Aja is a two-story, five bedroom property. There are 4 luxury suites and the 5th bedroom is a children’s bedroom with 2 sets of bunk beds. The first bedroom, Blue, is located near the main entertainment area. 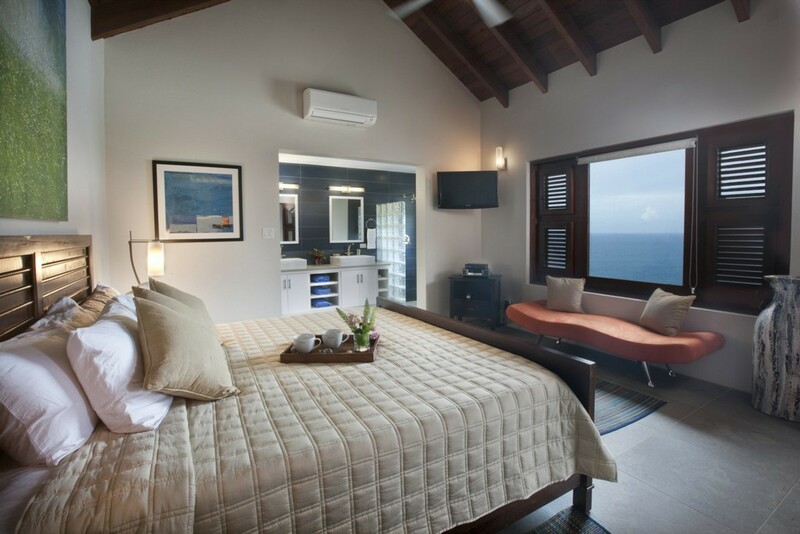 This bedroom offers wonderful views of the pool and azure ocean beyond. The second bedroom is located across the walkway to the other side of the pool, Mosaic, suitably named after the beautifully finished mosaic tiling in the bathroom, again in contemporary style with aqua-marine blues and greens which opens out onto a private wooden balcony with gorgeous ocean views across the bay. 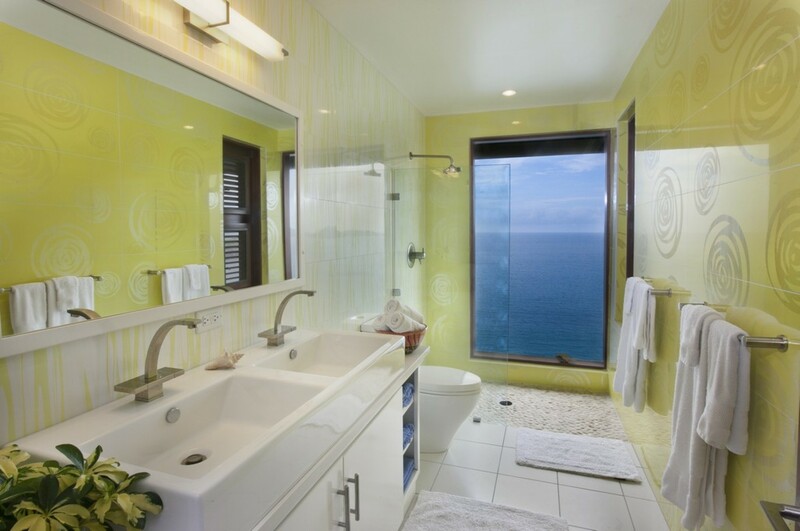 Next door you have the third suite, Sublime, with attached lime coloured bathroom and a wall of glass to the end. 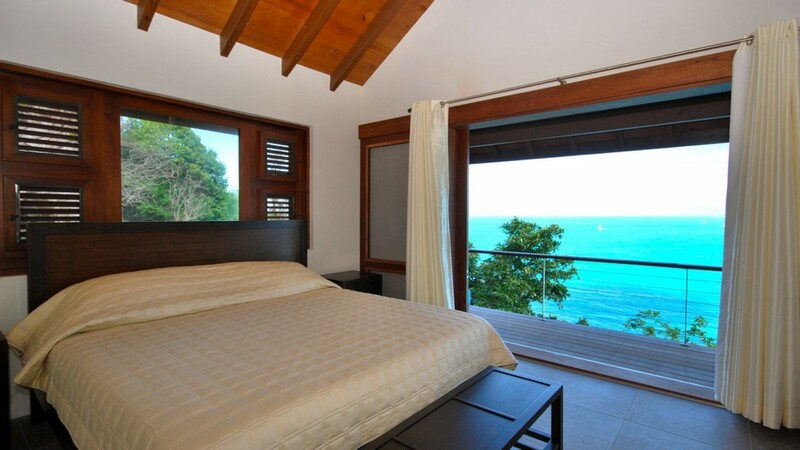 This suite also has a private balcony with views of the sea and the poolside. On the lower level sits a fourth bedroom suite, Copper-tone, this is the most private of all the suites, with a large private balcony. The vast double doors with full screens protect you from the insects by night and leave you safely cocooned next-to the ocean. 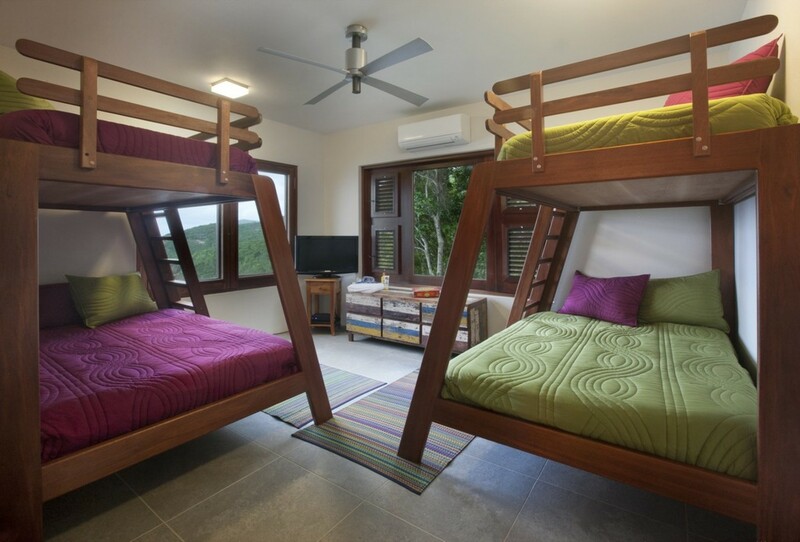 Close by, you have a fully equipped children’s room complete with bunk beds and adjacent bathroom (set out as a wet room), offering practical use and a clean finish, with the side wall opening out and allowing you to shower with nature. Laundry facilities are also kept downstairs on this level, behind heavy hardwood double doors. Aja Villa comes with maid service 2 times per week. 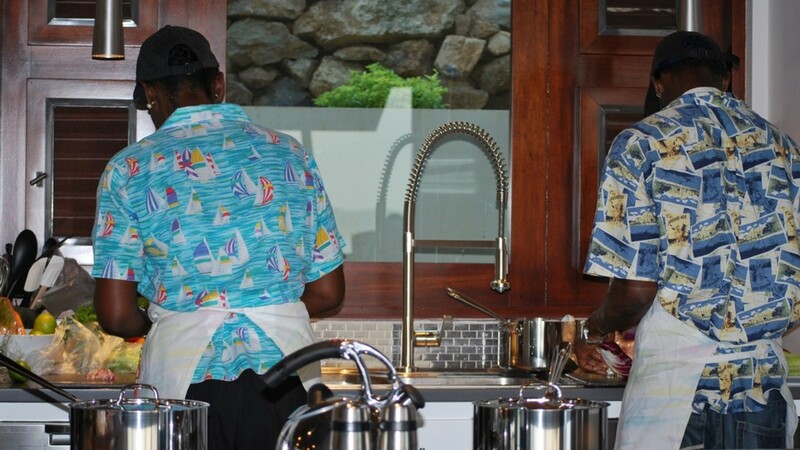 A chef can also be available on request to prepare delicious meals for you and your group. Note: Both Tax and Service Charge applies to Aja Villa. 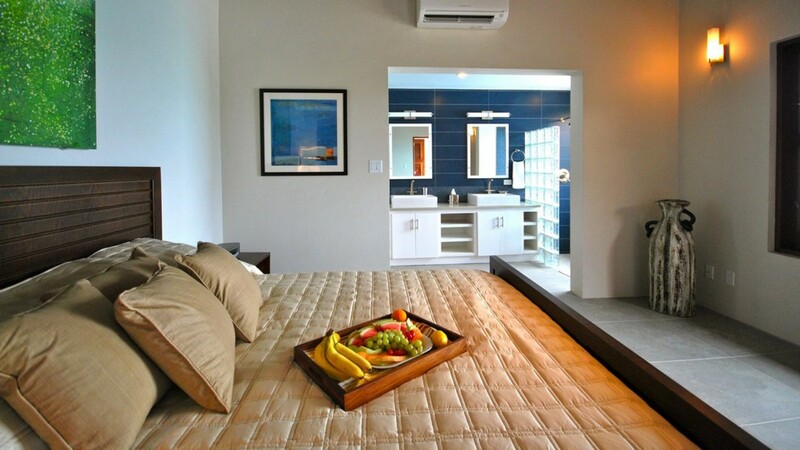 Privacy and relaxation is exactly what you will get in Aja Villa. 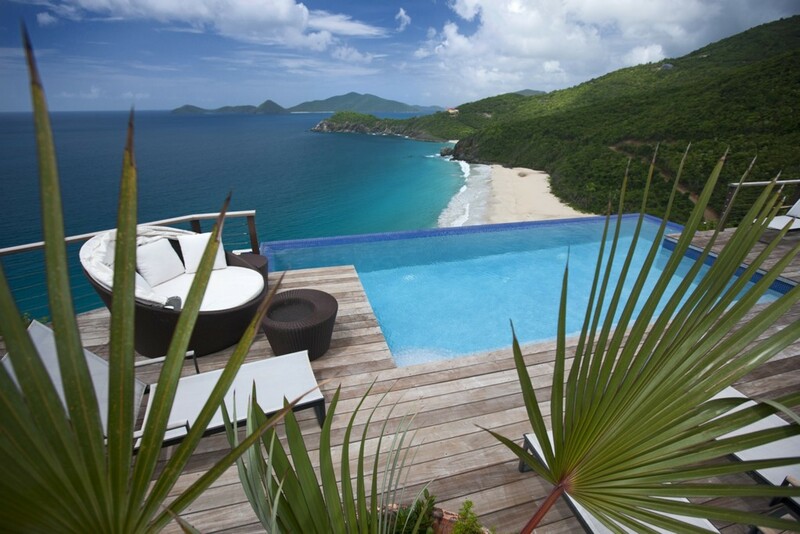 The views from this villa blew me away. 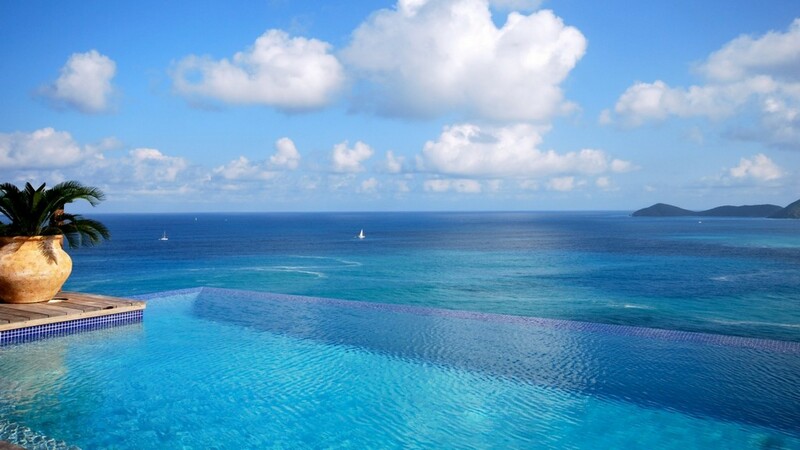 Looking out at the stunning Caribbean Sea, you will struggle to find better views. Whether you are in the infinity pool, dining alfresco or simply opening your bedroom door in the morning, you are always greeted with the turquoise ocean. 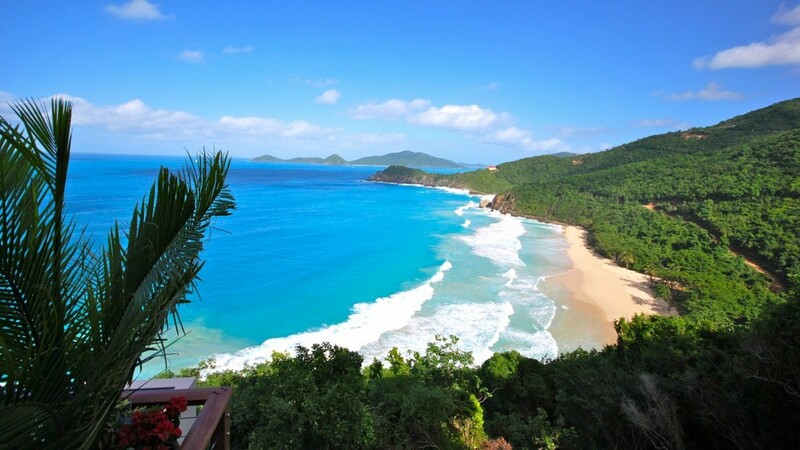 Trunk Bay Beach is reached by a private walk-way and is almost always quiet, giving guests absolute privacy. Perfect for families. Aja villa is breathtakingly beautiful. The views are simply to die for and the best part about the location is you have your own private pathway to the beach. the beach is really nice and sandy perfect for picnics or a relaxing rest on the beach. What I love about this villa is the location - its private peaceful and relaxing yet you are just 10 minutes drive to town.